Is there any more elegant, beautiful, graceful dog than the Collie? 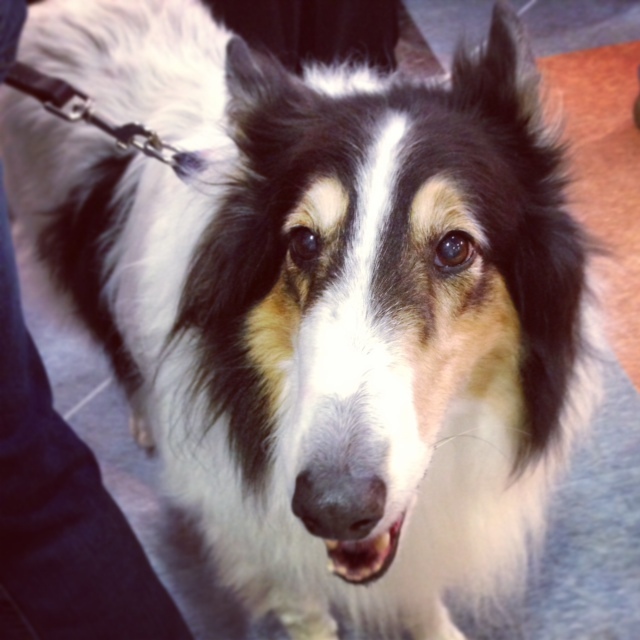 Lassie, famous dog of silver screen, was a Collie, after all. But did you know that not all Collies have that long, flowing mane of fur? What a handsome black tri-colored Collie this is! Its coat looks in-between, length wise. Collies have been working dogs in Scotland and England for centuries, herding sheep and cows for a living. This explains why the breed is perfect for agility. The herding breeds do extremely well at agility, naturally having the ability to weave, tunnel through, obey complex commands, follow their master and respond with lightning speed. The smooth coat Collie intrigues me. One site describes it as “Lassie in a gazelle suit”. 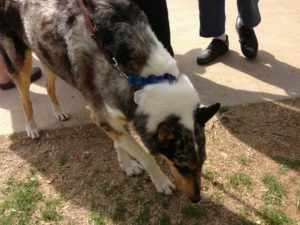 According to this site, the smooth coat Collie differs from the fluffy Lassie type in its lack of understanding its own strength. In other words, the smooth coat Collie ain’t your dainty princess. All other attributes aside, this dog can PLAY. Sweet. The long, thin nose and flat face are easily recognizable features of this lovely dog. This is one of the smooth coat Collies I met at the agility trials. Let’s walk through the pros and cons of owning a Collie. Those are all great reasons to own a Collie! I’m asking myself why we don’t have one. And why I don’t see more of them in my travels. Let’s check out the cons and maybe we’ll understand a bit more, though I doubt we will. Really? That’s all the cons? Lame sauce. This is a great dog. Medium in size, easy on the eyes, loyal and sweet, easy to train – what’s not to love? Keep in mind that if you’re buying a young Collie, all dogs, early on, chew. They chew everything. EVERYTHING. I don’t know how many people get rid of adolescent dogs because they chew everything and the owner doesn’t know how to channel that chewing or properly train their puppy, but I’m guessing it’s a lot. We’re seeing a TON of Craigslist ads this last month for free young dogs. Sad. So. What do you do with a chewing pup? Jones Natural Chews, of course! As with a teething toddler, you’ll need to monitor your puppy’s chewing of any bone or toy or treat. A friend of mine got a puppy this weekend and he’s chewing the legs of the table and the couch and everything else in sight. She brought home an armload of Jones bones, things like the rib bone and center bones – a Jampacked Jawzer or a knuckle bone would keep a little guy busy for awhile – and he’s settled down quite a bit. You want a bone that is too big to fit in his mouth and will keep his needle puppy teeth gnawing for awhile. And keep an eye on your teether! Thanks for stopping by. We do a breed of the week every Wednesday, so stop by again next week, or subscribe to the blog.